(U//FOUO) While the FBI has no information to indicate a specific attack has been planned against the United States or US assets in response to the “International Burn a Koran Day” event, the FBI assesses with high confidence that, as with past incidents perceived as acts of desecration against Islam, extremist actors will continue to threaten or attempt to harm the leaders, organizers, or attendees the event, scheduled for 6:00-9:00pm on 11 September 2010 in Gainesville, Florida. Depending on the continued national and international publicity the event receives, it may also inspire retaliatory attacks against US facilities overseas. 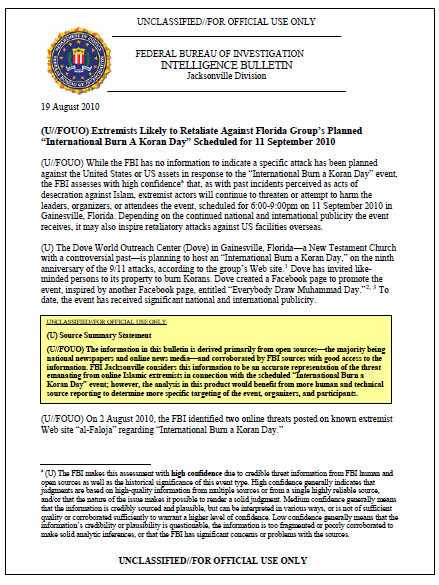 (U) The Dove World Outreach Center (Dove) in Gainesville, Florida—a New Testament Church with a controversial past—is planning to host an “International Burn a Koran Day,” on the ninth anniversary of the 9/11 attacks, according to the group’s Web site. Dove has invited likeminded persons to its property to burn Korans. Dove created a Facebook page to promote the event, inspired by another Facebook page, entitled “Everybody Draw Muhammad Day.” To date, the event has received significant national and international publicity. (U) In the spring of 2010, two similar events took place within the United States that were widely perceived by Islamic extremists as defaming the prophet Mohammed. Both events spawned international outrage from the Muslim community and resulted in significant threats from extremist Islamic elements via the Internet. • (U//FOUO) South Park’s Airing of Mohammed in a Bear Suit. In mid-April 2010, South Park aired a controversial episode that included a caricature of the prophet Mohammed. According to open sources, following the release of the episode, Viacom/Comedy Central and the creators of South Park received numerous threats regarding this episode. For example, in an article on www.RevolutionMuslim.com, Islamic extremist Zachary Adam Chesser warned the creators of the South Park series that they might end up like Dutch filmmaker Theo Van Gough, who was murdered in 2004 by an Islamic extremist after making a film critical of Islamic society. Zachary Adam Chesser, aka Abu Talhah Al-Amrikee, was arrested in July 2010 for trying to join al-Qa’ida affiliated terrorist group Al-Shabab located in Somalia. (U//FOUO) As documented in numerous reliable news sources, other notable events involving the desecration of Mohammed or insult to Islam resulted in lasting political and social consequences. Lars Vilks, a Swedish artist and free speech activist, and Kurt Westergaard, a Danish cartoonist, experienced death threats, al-Qa’ida-affiliated Islamic State of Iraq bounty issuances, and multiple assassination attempts for authoring cartoons/drawings of Mohammed in 2007 and 2005, respectively. In addition to targeting Vilks and Westergaard, extremist groups also targeted the editors and the publishing companies which disseminated the cartoons. Geert Wilders, Dutch writer and commissioner of the film Fitna, which examines the Koranic-inspired motivations for terrorism, received multiple death threats, was targeted by al-Qa’ida for assassination, and was identified as the target of an assassination attempt by two members of the Hofstadgroep. The international controversies also spawned violent protests, embassy burnings, the boycott of goods and services (boycotts reduced Danish exports by 15.5 percent, $170 million, from February to June 2006), and official reprimands from several foreign governments to include Iran, Pakistan, Afghanistan, and Egypt.